A team of researchers from the University of Maryland, the State University of New York and NASA's Goddard Space Flight Center has found that new global tree growth over the past 35 years has more than offset global tree cover losses. In their paper published in the journal Nature, the group describes using satellite data to track forest growth and loss over the past 35 years and what they found by doing so. There has been a growing consensus in recent years that because humans cut down so many trees (most particularly in the rainforests) that global tree cover is shrinking. In this new effort, the researchers have found that not to be the case. They contend that global tree cover is actually increasing. 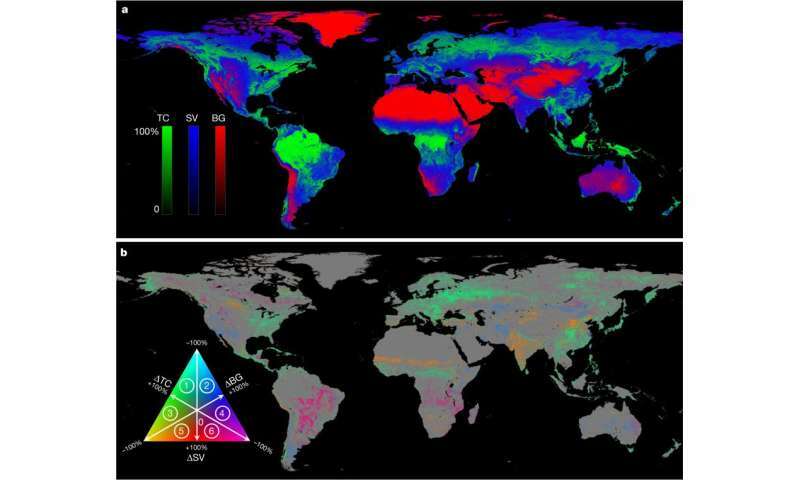 To track global tree cover changes, the researchers studied data from advanced very high-resolution radiometers aboard a series of 16 weather satellites covering the years 1982 to 2016. By comparing daily readings, the researchers were able to see small changes occurring regularly over a relatively long period of time—which added up to large changes. Over the entire span, the researchers found that new tree cover had offset tree cover loss by approximately 2.24 million square kilometers—which they note is approximately the size of Texas and Alaska combined. The researchers report that most of the new tree cover occurred in places that had previously been barren, such as in deserts, tundra areas, on mountains, in cities and in other non-vegetated land. They further report that much of the new growth came about due to efforts by humans (such as reforestation efforts in China and parts of Africa) and because of global warming—warmer temperatures have raised timberlines in some mountainous regions, and allowed forests to creep into tundra areas. Other areas of new tree growth resulted from large farm abandonments in places like Russia and the U.S. The researchers report that their calculations showed that human activities have directly caused approximately 60 percent of new global tree growth. They suggest their technique for monitoring tree cover could be used to predict tree cover changes in the future due to global warming. Land change is a cause and consequence of global environmental change. Changes in land use and land cover considerably alter the Earth's energy balance and biogeochemical cycles, which contributes to climate change and—in turn—affects land surface properties and the provision of ecosystem services. However, quantification of global land change is lacking. Here we analyse 35 years' worth of satellite data and provide a comprehensive record of global land-change dynamics during the period 1982–2016. We show that—contrary to the prevailing view that forest area has declined globally—tree cover has increased by 2.24 million km2 (+7.1% relative to the 1982 level). This overall net gain is the result of a net loss in the tropics being outweighed by a net gain in the extratropics. Global bare ground cover has decreased by 1.16 million km2 (−3.1%), most notably in agricultural regions in Asia. Of all land changes, 60% are associated with direct human activities and 40% with indirect drivers such as climate change. Land-use change exhibits regional dominance, including tropical deforestation and agricultural expansion, temperate reforestation or afforestation, cropland intensification and urbanization. Consistently across all climate domains, montane systems have gained tree cover and many arid and semi-arid ecosystems have lost vegetation cover. The mapped land changes and the driver attributions reflect a human-dominated Earth system. The dataset we developed may be used to improve the modelling of land-use changes, biogeochemical cycles and vegetation–climate interactions to advance our understanding of global environmental change. and during the last interglacial the Amazon rain forest didn't exist at all. and they told us we'd die . . .
My city is definitely losing treecover. People are absolutely bananas about cutting everything down around here.